Do you ever find yourself doing something... and you don't know why? Like playing hours upon hours of free cell? Or what is that other game called? Bejeweled? I'd like to say I'm one of those people who cleans the kitchen when it's already clean. I'm not. But sometimes I do do things just cause... Mainly knitting. Like this! But what is up with this hat? It's kinda ugly... Why did I make it? I don't know. I don't need another hat. Especially not in these colours. 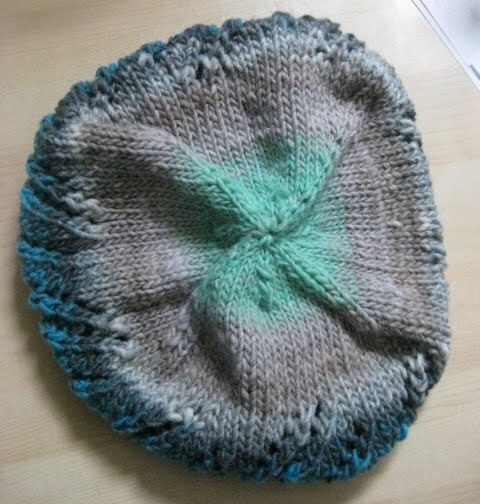 In this case, the only reason I made this hat was because I wanted to be knitting. My fingers wanted to do the action, my mind wanted the getaway that knitting (when I don't have to follow a pattern) provides. So randomly looking through my stash I saw this lone ball of yarn and somehow it just made sense to make a simple hat. 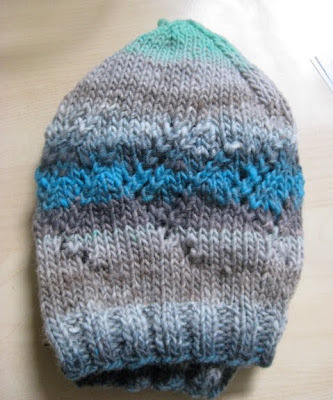 The pattern, yo and all, came from my head and what I remembered from the multitude of other hats I've made. What am I going to do with it? Probably not wear it... Or at least I won't wear it that often. But that's okay... Sometimes you just do something, to do it.